An SEC Championship game without Alabama would have been unthinkable for much of the season, but here we are. A revenge game for another former No. 1-ranked squad against the team that dumped both it and the Tide from top spot. Georgia and Auburn, both 7-1 in conference, stand on the brink of a place in the College Football Playoff, with the winner all but guaranteed a spot in the final four, and the runner-up facing the vagaries of the selection committee should they be ranged against the likes of ‘Bama, Ohio State and Miami for the fourth berth. First things first, however. The initial meeting suggests that this should be easy pickings for Auburn, after the Tigers humiliated then-No. 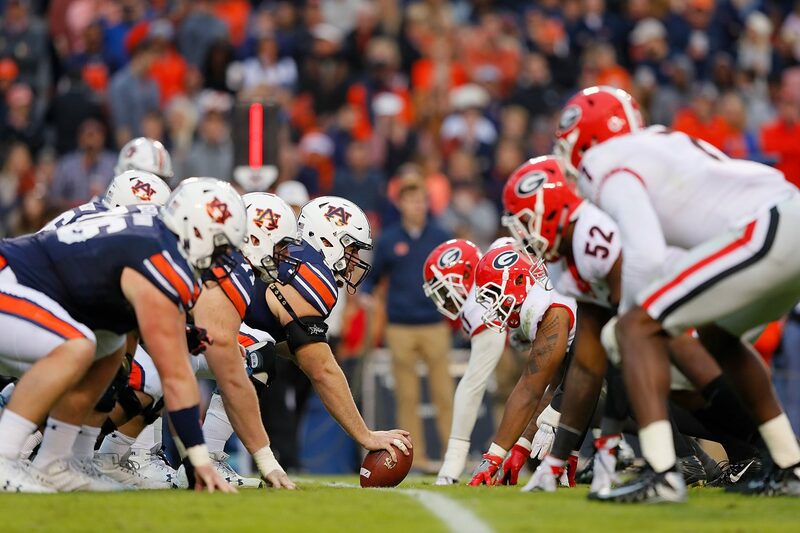 1-ranked Georgia 40-17 in Jordan-Hare, but the second game is unlikely to be as one-sided – or even have the same winner – as the winners of SEC West and East, respectively, reconvene at Atlanta’s glossy new Mercedes-Benz Stadium. Georgia, now ranked sixth in the nation, looked imperious before heading to the Plains to take on an Auburn side rising from early-season losses to Clemson and, more surprisingly, LSU, and have piled on the points since, but know that they are in for a close game this weekend. Based on the evidence of game one, fourth-ranked Auburn is stronger on both sides of the trenches and, despite the known quantities of Nick Chubb and Sony Michel in Bulldog red, possesses the better run game. But Georgia has enough about it – particularly if they can cut out their mistakes and indiscipline – to believe it can win. The Bulldogs freshman QB Jake Fromm has had time to grow into the role since replacing the injured Jacob Eason in Week 1, but was stifled in the first meeting between the teams, while opposite number Jarrett Stidham has shown his ability under centre for Auburn, particularly in the games that helped bring the Tigers to the championship showdown. If it comes down to a battle of the signal-callers, experience should win out. Auburn, however, also relied heavily on running back Kerryon Johnson as the foundation for head coach Gus Malzahn’s short-pass gameplan against the Bulldogs, but head to Atlanta this weekend with their star a little banged up. Even if he plays, as seems likely, he may not be able to shoulder as much of the load, giving the Dawgs further encouragement. With Alabama out of the CFP picture, if only temporarily pending other results this weekend, there is much to play for this weekend. Can Georgia bounce back and show that they deserved the interim No. 1 spot? Or is Auburn the real deal, destined to uphold SEC honour in the playoffs? Only time will tell.